for centuries. The haunting beauty and majesty of the pipes add a distinctive touch to any special occasion. Submit your inquiry using the form on this page or call Joe Todero (402) 800-5867. If you are thinking of having a piper and/or drummer for your event, see the items below to take into consideration. Click on the image above to request a live bugler for a military veteran’s funeral. Decide what you want the piper to play: We can help you with the selection of contemporary or traditional Scottish and/or Irish tunes but keep in mind the bagpipes have a limited range of notes it can play. A bagpipe is a LOUD instrument; we can’t tone it down. The more pipes or drums that you add, the louder it will be. Will this be a surprise? We have been asked to arrive unseen and tune up elsewhere. In a church setting, this can be facilitated by having a “warm-up” room available in another building away from the main chapel. All of our pipers and drummers are experienced and accomplished performers. 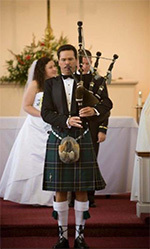 The piper will contact the wedding planner/bride in advance to work out any details and arrive early to tune and make any last-minute adjustments to the performance. Birthdays, office parties, retirements, holidays, graduations, we’ve played them all and no event is too small or too large. We’ve performed (twice) with the Chieftains, the Omaha Symphony, for inaugurations, civic events, parades, and memorials. In short, we can probably accommodate any event you have. How far did the bagpiper travel and how long to dress, tune, and perform? Like a lawyer, a bagpiper can base their value on the time spent on completing the performance. What is the value of equipment and maintenance? Bagpipes typically run $1,500 and up. Highland attire will run another $1,500 and up. Are you willing to pay for quality? Bagpiping is not for the faint of heart. Great bagpipers deliver at the big moments. It’s one of the reasons they command a higher price. Bagpipers can also place value on the time they dedicate to their craft or how many years they have spent learning the instrument. Distance traveled. For performances outside the Metro-Omaha area, a trip fee is assessed in relation to the travel time involved, and is included in the total amount quoted. Parking fees and/or other travel expenses such as bridge tolls will also be included. The total amount of time. For example, when requested to play at the ceremony and reception, the performer(s) may be needed for several hours. We have a minimum charge for the performance; subsequent hours are charged at a reduced rate. Performances on some major holidays and holiday weekends may be charged at a higher rate. Fees for the Metro-Omaha area. For performances outside the Metro-Omaha area, a trip fee is assessed in relation to the travel time involved, and is included in the total amount quoted. Parking fees and/or other travel expenses such as bridge tolls will also be included. Submit your inquiry using the form on this page or call Joe Todero (402) 800-5867 for a quote.